I am not the most precise of cooks. I take shortcuts, measure by eyesight, play fast and loose with recipes. I never use cake flour, rarely sift anything, freely substitute ingredients. And most of the time, things turn out very well indeed. Some people would say, “Oh, you’re a cook, you’re not a baker. Baking must be done with precision!” But I do bake quite a bit, and while baking requires MORE precision than cooking (I would not suggest, for example, leaving out baking powder altogether), there’s still quite a bit of wiggle room, and most things come out just fine, even with my wild and crazy ways. Macarons are not one of those things. The 2009 October Daring Bakers’ challenge was brought to us by Ami S of Baking Without Fear. She chose macarons from Claudia Fleming’s The Last Course: The Desserts of Gramercy Tavern as the challenge recipe. If you’ve never had a macaron, you should. These are not the gooey, coconut confections ubiquitous at Passover, but French almond cookies similar to meringues sandwiched together with a creamy filling. 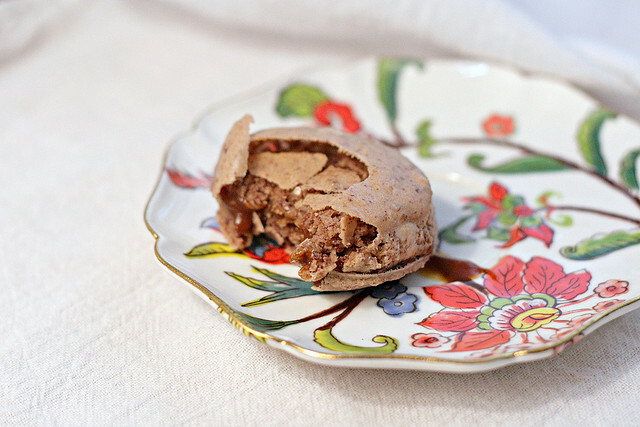 A properly made macaron has a smooth, crisp shell over dainty, ruffled “feet”, and when you bite into it, you get first the crunch exterior shell then chewy almondy macaroon then creamy filling. In Parisian patisseries (where they are all the rage), you can find them in a glorious rainbow of colors and flavors. Trust me, when made properly, they are a treat. They are finicky little bastards, though. Humidity, imprecise measurements, over mixing, under mixing, mixing clockwise when you should have mixed counter clockwise – all will sink you, and you’ll be left with is a cookie that will probably taste fine, but isn’t a macaron. In fact, these took me three full tries – the recipe from Claudia Fleming (who is usually amazing) was a disaster for me. However, I was tutored by the amazing Helen of Tartelette, who coached me into making the glorious specimens you see before you – domed top, ruffled feet and all. In the end, macarons are something I’m glad I made — and conquered – but I’m not particularly tempted to make again. I prefer my slapdash ways, and will leave the macaron making to the professionals. Even with a great recipe, these take practice, but are worth perfecting. Shells are from Tartelette, Salted Butter Caramel Sauce is from Smitten Kitchen. 90 g egg whites (about 3), left out for 2-3 days (egg whites don't spoil the way the yolks do) or "aged" in the microwave for 10-15 seconds (ideally, egg whites should be almost liquid). Combine tea, almonds and powdered sugar in the food processor and pulse until finely ground and no lumps remain in the powdered sugar. In the standing mixer with the balloon attachment, beat egg whites until soft peaks form. Gradually add granulated sugar, and beat until meringue is stiff. I mean REALLY stiff. If you're not sure, beat a couple of seconds more. Are they stiff enough? Good. With a rubber spatula, fold in ⅓ of the almond sugar mixture, using quick, firm, strokes. You want to break up the meringue in this step -- don't be too gentle! Add remaining almond mixture, ⅓ at a time, and use gentle strokes to fold it it until all almonds are incorporated, no lumps of meringue remain, and the mixture is the texture of chilled honey -- when you drop a teaspoonful of the mixture on top of the rest of the batter, it should take 30-60 seconds to disappear and be reincorporated. Using a pastry bag or a ziploc with the corner cut off, pipe the meringues into 1 inch circles on parchment paper. I found this not particularly difficult to eyeball, even though I'm not a piper, but if you're worried about it, you may want to trace circles onto the parchment first. Remember, you want some consistency so you can match them up in sandwiches. Whisk the sugar as it melts to ensure it heats evenly. When the sugar is a lovely dark copper color and you can smell that it smells adequately caramelized, turn off the heat, add the butter all at once, and stir it in. Then add the cream, stir to incorporate, and store in glass jars in the refrigerator. Well, look at you! Third time’s the charm! They turned out perfect! Looks like you really put in the effort and it paid off. Congrats! That last batch is perfect! Such perseverance certainly pays off! Congratulations on your macarons! You are one persevering woman. I would have walked away and called it a week after two tries. all of your batches turned out beautifully! and salted caramel sounds divine. well done! Oh these look so good! As much as I enjoy baking, I generally avoid baking anything involving egg whites, but macaroons have always been so tempting. This might be the inspiration I need to give it a try. Salted caramel filling sounds like a brilliant idea considering how sweet the shells tend to be. Congrats on your picture perfect macarons! Quite an accomplishment! oh yeah! they turned out brilliantly. well done on keeping at these! WOWOWOWOW wonderful effet the 3rd time and you got the contrasting textures perfectly. Beautiful effort and it looks like macarons have taught you to read a recipe to a high precision LOL LOL LOL. Worth the effort they look marvellous, Cheers from Audax in Australia. Kate, they came out very nice. I am glad to hear that most of us had the same issue with the recipe – nice to know it is not us. 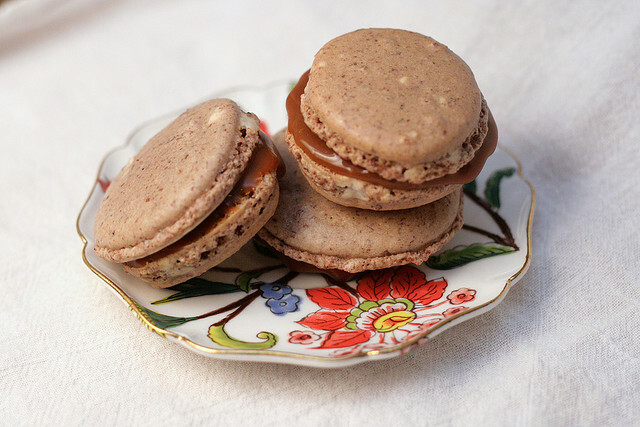 As well, I would eat a macaron with feet or without, as long as salted caramel was a component! I love making that sauce!!! ps… goes really well with pumpkin pie, too! You are an inspiration! I have never attempted macarons – they are on my list for the year but just don’t have the guts yet. I am like you, sometimes. Most of the time, if something doesn’t turn out, I throw the recipe away in frustration. But occasionally, I get obsessed and keep trying until I get it right. Bravo to you! But they tasted divine, right? I think all of your macs look wonderful! Love the flavours you chose – awesome job on this challenge!! I’m glad yours worked out, and you followed the adage, “practice makes perfect.” I’m also a wing it cook and also cut the recipe in 1/2 by using 3 egg white (bad math). I had a failure but since I made them on the evening of reveal night, that’s what I had to show. They were still tasty though. It look amazing , Thanks for the recipe. Wow…three efforts and success. They look lovely, and believe me I know the feeling….for I have fallen into the gang of addicted macaron makers! Am eager to try this recipe but what is granulated sugar and what is powdered sugar? Is granulated the one we normally would put in tea or coffee? And is powdered sugar the one used for icing? or is it the finer version of granulated? Sorry but in Australia, I think we call these differen things. Powdered Sugar is also called Confectioner’s Sugar and I believe in Australia is icing sugar. Granulated sugar is the regular sugar in small crystals. Yum! they look so good! I don’t have a digital scale. can i still make them well? could you translate it so people without them can make these? also can i substitute the tea for chocolate? of other things? Thanks!